B&W ointment uses all natural ingredients to help soft tissue heal faster, while keeping the wound sterile, and soothing pain. The Amish community has been using B&W Oinment as an alternative treatment to hospitals for years. Scientists investigated the practice, and found that B&W Ointment works as an alternative burn treatment[1,2]. Although it is not for severe burns, it can be used to treat severe burns when there are no other options. It is NOT a substitute for hospital care, however. B&W Ointment uses honey mixed with beeswax for its antibacterial properties. A variety of other anti-inflammatory and pain relief ingredients are mixed into the honey including extract from the well known burn treatment, aloe. Below is a list of the ingredients and their medical properties according to current scientific studies. The skin is red and painful with some minor damage, but no blisters; think sunburn. The skin is red, blistered, swollen, and painful. The burn area might also look wet and shiny or be white/discolored in an irregular pattern. There is no nerve damage in 2nd degree burns. The skin has been burned all the way through. It may be dry and leathery to touch and change color to black, white, brown, or yellow. The burn will feel numb in the middle and painful on the edges because the nerve endings have been destroyed. Skin will not regrow because the cells responsible for regrowth have been destroyed. 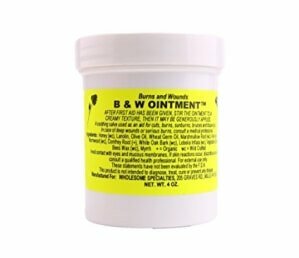 B&W Ointment works best on injuries where the skin is broken, but the bleeding has been controlled. The two most common of these injuries are burns and scrapes because burns cauterize blood vessels, stopping bleeding, and scrapes are often shallow over a large area with limited damage to major blood vessels. In both cases infections are common because large areas of the skin have been damaged, opening the underlying tissue to bacteria. With scrapes there is often debris embedded in the skin that needs to be removed as well. In these cases B&W ointment will protect the wound from outside bacteria and stop bacteria already inside the wound from growing. In other wounds that bleed more, the blood pushes dirt and debris out of the wound, preventing infection. In this case the largest concern is stopping the bleeding. Vetbond surgical glue will close smooth cuts, stop blood flow, and seal the wound against infection, but while it prevents outside infection from getting in, it doesn't kill bacteria that are already inside like B&W ointment. That's not to say that B&W ointment is an antiseptic, but it does prevent bacterial growth. B&W is a long term treatment option that will speed healing and prevent infection. To stop bleeding hold direct pressure on the wound site, and use surgical glue if wound closure is needed. For large area wounds that bleed a lot, use hemostatic gauze with an israeli bandage. Draw out the heat by holding the burn under cool running water for 10 to 15 minutes. Smear B&W Ointment liberally over the entire burn. Cover the burn with a sterile dressing. Change the dressing 1 - 4 times per day as needed. For severe 3rd degree burns or burns that cover a large area of the body call 911 and get medical help immediately. B&W Ointment will not cause problems with severe burns, but professional medical help is necessary. Fill a used Carmex, 1/2 oz, lip balm container with B&W Ointment for portable first aid kits. Just be sure to label the container with permanent marker or tape. Blisters protect the skin underneath from infection. Don't pop them unless you need to. See here for more information on treating blisters. Kolacz, Nicole M., et al. "The effect of Burns & Wounds (B&W)/burdock leaf therapy on burn-injured Amish patients: a pilot study measuring pain levels, infection rates, and healing times." Journal of Holistic Nursing 32.4 (2014): 327-340. Efem, S. E. E. "Clinical Observations On The Wound Healing Properties Of Honey". British Journal of Surgery 75.7 (1988): 679-681. Web. 7 Sept. 2016. Rodriguez-Bigas, Miguel M.D., et al. "Comparative Evaluation Of Aloe Vera In The Management Of Burn... : Plastic And Reconstructive Surgery". LWW. N. p., 2016. Web. 7 Sept. 2016. Al-Snafi, Ali Esmail. "The pharmaceutical importance of Althaea officinalis and Althaea rosea: A review." Int J Pharm Tech Res 5.3 (2013): 1387-1385. Mulkijanyan, Karen, et al. "Burn healing compositions from Caucasian species of comfrey (Symphytum L.)." Bull. Georg. Natl. Acad. Sci 3.3 (2009): 114-117. Dawid-Pać, Renata. "Medicinal plants used in treatment of inflammatory skin diseases." Postepy Dermatol Alergol 30.3 (2013): 170-177. Huang, L. D., et al. "Experimental study on anti-inflammatory and analgesic effects of different extracts from Chinese Lobelia." Herald of Medicine 31.8 (2012): 982-985. Carbajal, D., et al. "Anti-inflammatory activity of D-002: an active product isolated from beeswax." Prostaglandins, Leukotrienes and Essential fatty acids 59.4 (1998): 235-238.